Another one bites it. https://www.cp24.com/news/several-pedestrians-struck-across-the-city-during-traffic-rush-home-1.3755822 Can anyone what unit number it occurred? 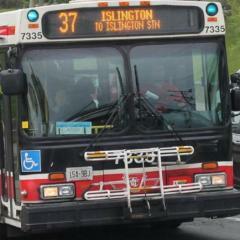 New Eglinton is also full too with almost ~325 buses on the property consisting of the LFS and the remaining VIIs. So Concord is off the table? Malvern seems to be expanding temporarily with almost 300 buses since McNicoll is under construction. Don't forget routes 102 and 169, they were once Malvern routes long ago. Are there any other routes outside the confirmed ones moving? Hmmm.... I 100% agree with you on this one. St. Clair Ave. E and Markham Rd would need a Blue Night service. Warden Avenue south of Sheppard hasn't had one since 1998 but could be reinstated as the 368 WARDEN NIGHT bus if they could reroute the 324 to Victoria Park north of Sheppard. 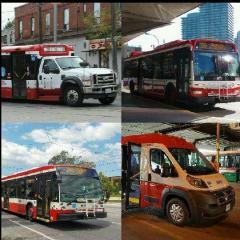 You also forget the lack of night service on Leslie, Bayview, Old Mill, Martin Grove and Weston as well. IIRC, I believe the 190 SCARBOROUGH CENTRE ROCKET is being swapped for the 57 MIDLAND between Malvern and New Eglinton since both routes use 10~ buses during rush hours. Per @leylandvictory2, it would appear Mount Dennis is picking up 7 BATHURST and 29 DUFFERIN from Wilson. Can anyone confirm or deny the rumors? And the January 2018 service changes is out: https://stevemunro.ca/2017/12/27/ttc-service-changes-effective-january-7-2018/ 14 GLENCAIRN will get additional running time due to LRT construction. Several Service Relief buses from multiple garages during rush hours is used on the 32 EGLINTON WEST is being restructured. 711 WILSON, 716 BIRCHMOUNT, 719 MOUNT DENNIS and 720 COMSTOCK (EGLINTON) replaces the 773 MOUNT DENNIS RELIEF buses, which eliminates service outside of rush hours. 75 SHERBOURNE trips now begin and end at Sherbourne Stn. Whenever Pioneer Village and Finch West Stns. are closed, various routes (e.g. 36 FINCH WEST) skip the station. It may safe to say that #8106, #8110, #8120, #8129 are tracking at Hillcrest presumably being rebuilt at the moment but have yet to enter service. Rode it this morning. It was behind #8785 on the same route. Pizza, Chicken Wings, meatball Pasta, some apple juice and maybe Chocolate chip ice cream. Hey fellas, Does anyone have the destination sign codes from 1997 onwards and today? All I found is the ones from 1996 from Rollsign Gallery: http://www.rollsigngallery.com/esigns/e009-Toronto19960616.html Anyone working at the division is appreciated to help. None of the destination sign codes could be found anywhere including CPTDB Wiki. Thanks. Did they also replace the original lamps with the LED ones during rebuild? I think they may have used the Orion VII parts in the process. AFAIK, I think #8789, #8822, #8824, #8829, #8837, #8873, #8906, #8916, #8948 should be on property by now despite not having its trackers on yet. Can anyone spot them?